During my workshops a question comes invariably "This clock is so cool, where did you find it?" Good news, now you can order it right here! I have decided to sell only Time Timer® Medium 8'' (18cm). This format is the most versatile and is perfectly adapted to creative workshops and classrooms. The alarm clock works with a single AA (not included). No annoying ticking, no distraction. When time is up an alarm can be activated. This model is rated Able Play, ( a rating rating system that focuses on the developmental areas of physical, sensory, communicative, cognitive, and social/emotional abilities of a child). "Seeing" the time is a key factor of success in a meeting. The principle of Timeboxing allows to allocate some time to a specific task and to bring out the best ideas. Have you ever been stuck in an endless meeting not leading to anything? Now try to define the goals and come up with an agreement in a given time. This time restriction allows not to scatter, to go to basics and actually find solutions. 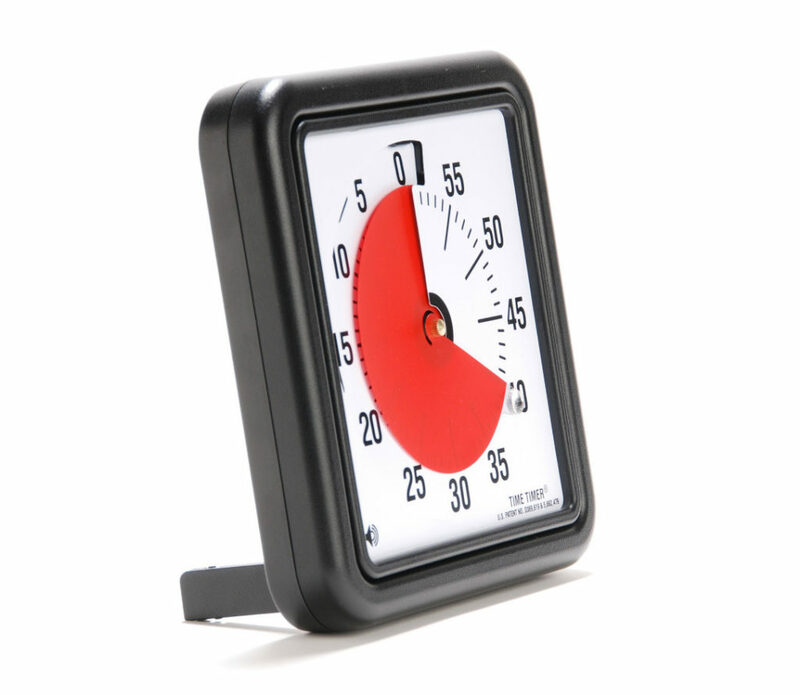 Time Timer® alarm clock just materializes the time like no other. Today this clever visual timer has found its place in the offices of the best companies in the world (Google, Medium, Reuters, Spotify ...) and in thousands of classrooms. This story appears in its entirety in the Sprint book, Jake Knapp, Simon & Schuster. One day of autumn 1983, Jan Rogers was struggling to respond to incessant questions from Loran, her 4 year old daughter who could not understand what was her watch indicating. The concept of time is often difficult to get for young children. Jan used all types of watches or clocks but nothing seemed to work. Finally, she decided to create her own version of a timer that would be simple and understandable. One evening, sitting at the kitchen table, she began to experiment by just using pieces of cardboard and scissors. She obtained a very simple design: a red cardboard circle that was slipping into another white circle. The red materialize time and Loran immediately got it. This early prototype lead to a great product and Jan decided to call her invention the Time Timer®. Jake Knapp is a renowned designer currently working at Google Ventures. 3 years ago he conceptualized the process of UX Design Sprint and organizes digital creation workshops with the best startups of the moment. (Slack, Blue Bottle Coffee, Uber, Medium ...). Jake Knapp being a true office supplies nerd, had in mind to find the perfect clock to ensure that the Sprint would stay on the right tracks. After many experiments, he finally discovered the Time Timer® which became the "official" Design Sprint clock.